Pricey solution to an inexpensive amp's problem? The Mission: Satisfactorily ensonify a listening room measuring a bit more than 15 by 27 feet with a cathedral ceiling 12 feet at the peak (for you adherents of that newfangled metric system thing, that's around 5, 9, and 4 meters, respectively), mostly wood, glass, and plaster but deliberately designed to avoid parallel surfaces as much as possible. An arch at the rear leads to another large room. The Music: Mostly classical, in recordings from the turn of the 20th century to the day after tomorrow and covering the entire literature--organ, big and small orchestra, chamber, solo instrumental, solo and small ensemble vocal, choral, opera, and anything else that catches the owner's fancy, up to and including duets for bagpipe and hurdy gurdy. The Challenge: Find speakers to accomplish The Mission driven by, and expressing the high-definition virtues of, a tiny Trends 10.1 Class-T amp developing at most around 6 clean watts per channel. The Complications: The speakers must be placed in a bank of well-filled record shelves spanning the narrow front end of the room to a height of around 8 feet (i.e., about 2.5 meters); floor placement is not an option. As the installation cannot gracefully accommodate a subwoofer, the speakers need to have sufficient bass extension for The Music without supplementation. The owner is a cheapskate. The Proposed Solution: Pinnacle DB 650 Series II bookshelf speakers. Early on, I zeroed in on the newly released Rogue Sphynx as a likely candidate for a new amp, but my hopes for that foundered on repeated frustrations in trying to audition one in the absence of a local dealer. 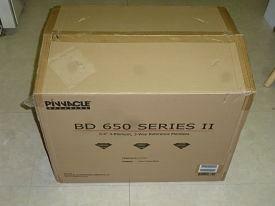 Similar problems held me up in considering the most promising speaker option I'd found, the Pinnacle BD 650 Series II. With both listing for substantially more than $1,000 and generally unavailable at any kind of discount, I was quite reluctant to buy either without an initial hearing. Then fate intervened: a chance eBay search turned up an unopened pair of the Pinnacles, "buy it now," for less than half list from a home theater installer who had acquired them for a contract that fell through. Or was that the driver of a white van? Anyhow, swallowing hard and holding my breath, I made my decision and pulled the trigger. Pinnacle has been around for a long time, since 1976 in fact. The company is family owned and centers its operations in Massachusetts and New York State, where it actually builds at least some of its products, so I suppose in a sense they are heirs to the "New England" school of which my old KLH Sixes were iconic examples. The speakers under review are labeled "designed in the United States," not quite the same as "made in USA"; a casual e-mail to the company about that and a technical question drew two responses (which even cited the TNT article about the Trends 10.1!) within an hour but failed to yield a definitive answer about their national provenance, not that I'm terribly concerned, as long as the things work well. Be that as it may, I have the impression that Pinnacle products have a loyal following that isn't even extensive or public enough to qualify as "cult"--a real "under the radar" operation. A fair amount of searching on the Internet suggests that the usual review outlets for the most part ignore Pinnacle and that sales tend to be more to professional installers like my eBay seller than direct to consumers like me. In general, Pinnacle speakers embody ported designs, often with a species of canted waveguide that the company calls "Diaduct." 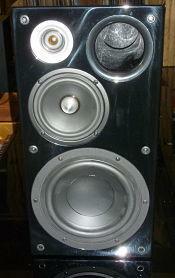 The speakers under review don't have the slanted guide, but each does have disproportionately large ducted port, nearly as large as the midrange driver, in its front panel, not in the more customary rear placement, meaning the 650 IIs are "bookshelf speakers" that actually can be placed on bookshelves instead of stands. Their compact dimensions are also suitable for such placement: the elegant curved-sided cabinets in round figures measure 9 by 15 by 14 inches, alas just a bit too tall to sit upright in shelves sized for LPs. 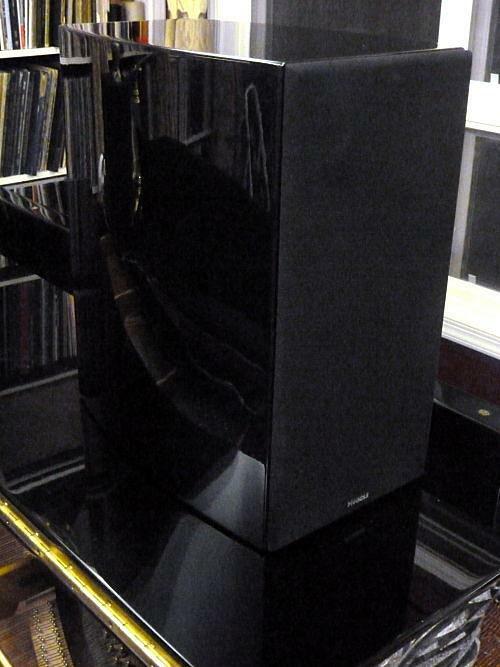 The BD 650 Series II is part of Pinnacle's "Black Diamond" line of home theater/home audio speakers, which includes in addition small satellites, two horizontal center channel speakers, one or two other bookshelf style models, a couple of towers, and a couple of powered subwoofers. Of the non-towers, the BD 650 II has the widest specified response, the highest level of sensitivity, and the highest price. 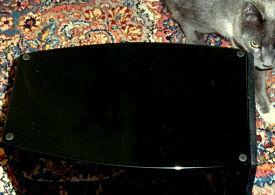 Like all entries in this line, the speakers are finished in a high-gloss piano black, according to the company requiring a week of work for each cabinet; to get an idea of the quality of the results, see the photograph above, showing one of my 650 IIs sitting on the lid of a high-end C. Bechstein studio grand piano. As you'd expect from their designation as "Series II," these speakers follow on an earlier BD 650. They are specified as going a couple of Hz deeper than their prececessor and to be slightly more sensitive. Claimed frequency response is 34 Hz to 25 kHz +/- 3 dB, down 6 dB at 30 Hz and 30 kHz. Depending on whether you consult the specifications drop-down on the product's Web page or the downloadable .pdf specification sheet, sensitivity is quoted at 93 or 96 dB at 1 Watt, seemingly an ideal figure for a T-amp, but note (ominous rumblings, please!) that the measurement is taken at half a meter, not the more customary full meter. The 650 IIs are rated at 8 ohms and embody a three-way design, with a one-inch silk dome tweeter, four-inch midrange driver, and six-and-a-half-inch woofer. The latter two drivers feature polypropylene cones with butyl rubber surrounds--no need to worry about foam rot. Besides indicating that the midrange driver occupies its own isolated chamber within the cabinet, company literature makes much of the driver's die cast phase plug, a bullet-shaped projection from the area ordinarily filled by a dust cap. Connections are a single pair of nice quality binding posts in an inset on the back panel of each speaker. Thus, they do not provide for bi-amping. The speakers arrived packed in a single box, awkward but not impossible for one person to carry. Well-designed firm foam separators kept them locked securely in place and safely away from the sides of the box, a good thing, because a driving rain storm the day mine arrived had well dampened the carton. 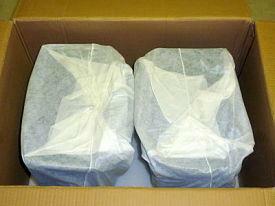 Each speaker was shrouded in a thin sheet of flexible styrofoam to protect the finish. Unpacking was a relatively simple matter of removing a number of heavy-duty staples to free the top flaps, lifting out the upper foam separator, lifting out each speaker, and removing the shrouds. Each speaker had four almost paper-thin rubber bumpers on the bottom (in the photo, visible under inspection by the four-footed king of our household), but because their height dicatated laying them on their sides in my shelves, before installing them I put down towels to protect that lovely gloss finish. I made my connections with bare wire; while the binding posts will accept banana plugs, I don't know if they're spaced properly for the double-pin type. Mention should be made of the owner's manual included in the box. I've seen more lavish printing jobs, but in every other way I'd call it a model for such things. In clear, simple English it walks the new speaker owner through the basics of connection, placement, and amplifier power requirements, offering helpful illustrations as needed. Obviously, the company wants its customers to understand how to set up its products to best advantage. Plunging boldly ahead, I immediately connected the Trends 10.1 amp to the Pinnacles and gave them a whirl. I did not like what I heard. The sound was harsh, shrill, almost completely lacking in bass. I didn't panic, however, figuring that they could be expected to need some break-in coming straight out of the box into a new environment. Off and on over the next couple of weeks, I kept playing them, and the sound did improve noticeably. In particular, the bass was no longer missing in action. That said, as driven by the Trends, what the Pinnacles were giving me never did rise to the level of "good"; with really well-recorded material, they sounded decent enough, but they were very touchy about volume, going painfully bright and harsh if turned up too much and prone to variable, not terribly natural bass, with a sense of being rather washed out in the middle. Nor did they do anything to minimize the defects of material falling short of "well-recorded." In short, I began to worry that I'd just made an expensive mistake. Maybe there was a reason Pinnacle speakers get so little word of mouth or review attention. Gloom began to settle in. At last, on a lark, I changed amps. As it happens, I have a Dayton DTA 100, the predecessor of the 100a models, that I carry with me as a headphone amp when (as is very often the case) I'm away from home shepherding my young daughter between athletic activities, music lessons, and whatnot. The 100 has a somewhat unsavory reputation because its volume control is poorly balanced; the 100a corrects that problem. Otherwise, the amps are closely matched, both looking the same, both being Class-T designs claimed to develop around 50 watts per channel, and both probably developing more like 25 or 30 clean watts in practice. The 100 was no monster, then, but it did offer a good five times the effective output of the Trends. I substituted it into the system, turned on some music, sat back--and gaped in amazement as the Pinnacles simply bloomed before my ears. Clearly, 93/96 dB claimed sensitivity notwithstanding, these speakers simply need some power to strut their stuff. In fairness, the manufacturer recommends a minimum of 15 watts, and this is one case where I'd say the customer had better pay attention. Well, of course, the DTA 100 was OK for a test, but, even leaving aside that it's no better built than the 100a and has been banging around in a bag for a couple of years out on the road, with that volume control issue it really wouldn't do long term. So, realizing that the Trends just wasn't going to work with these speakers, I held my nose/breath and ordered the latest incarnation of the DTA 100 series, the Dayton DTA 120, which develops a bit more power and no longer carries the 100a's restriction, first made known to me by a sticker affixed to my second DTA 100a, against use with 4 ohm speakers. For that latter reason, I was hoping that perhaps the build quality might be better, or at least more likely to hold up in long-term use, and when the 120 arrived it in fact did sport nicer speaker connections and RCA jacks. I was lucky enough to catch mine on sale for just shy of $90, for a total investment slightly more than $100 with shipping. Driven by the DTA 120, the Pinnacles have completely redeemed themselves, offering just the sort of Class-T definition that I was after all along. Over the next few evenings, I proceeded to do a somewhat random walk through material in my collection, some familiar and some that frankly I had never gotten around to playing. The speakers ably convey the color and character of a wide array of music: Copland's "Old American Songs" (William Warfield with the composer leading the London Symphony Orchestra); shape-note hymns performed by the Boston Camerata; Renaissance dance music by the Folger Consort, with an unexpected bell in one track so realistic I jumped; Schubert's Reliquie sonata performed by Friedrich Wuhrer for Vox in the early 1950s, in which the Pinnacles particularly well convey the pianist's warm, powerful bass-driven tone; the same pianist's contemporaneous recording of Beethoven's Choral Fantasy with Clemens Krauss, which can sound a bit dim but here was decently transparent; Ezio Pinza singing Torelli's "Tu lo sai" vividly projected from a '30s vintage Victor 78 RPM record; Beethoven's Fourth Symphony in a cheap MCA CD reissue of an early Westminster stereo LP; Capricorn in Rimsky-Korsakoff's Quintet for Piano and Winds. Voices come through with understandable diction, and instruments in small ensembles were consistently distinct. I've not tried the speakers with any jazz, but I suspect they would serve it well; they did handle a couple of tracks of Scottish folk music with aplomb. So how would I describe the overall sound of the Pinnacle/Dayton combination? The words that come to mind are "clear" and "clean," more Studio 8H than gothic cathedral. With the Class-T amplification, these are not speakers for those who want to wallow in a warm, romantic glow, and if I were to find any fault at this point it would be that they might be a bit bright with, say, early digital recordings or LPs with an overaggressive top end. For the 78s that are a big part of my listening diet, of course, that's not much of an issue. On the other hand, the speakers develop much bigger bass than one would expect from such a small package, carrying well below the 50-Hz-and-up characteristic of most modern mini-monitors and even many larger speakers. I don't have facility to test the Pinnacles' bass response scientifically, but I did play back a series of 1/3 octave pink noise test tones from a Telarc Omnidisc LP, and the results seemed in keeping with the manufacturer's claims. Judging by ear, in my room, with my restrictions on positioning, the Pinnacles were strong at 50 Hz, starting to struggle a bit at 40 Hz, still offering some faint low level output at 31.5 Hz, and no longer responding at 25 or 20 Hz. Not at all bad for a speaker standing only 3 inches taller and 2 inches deeper than an LP! Of course, our readership being what it is, I'm sure somebody out there is muttering, "Yeah, but what about with tubes?" My sole piece of tubed gear is an unrestored Fisher X-101-C integrated amp, a late design with six 12AX7s and four 7591s from just before transistors swept all before them. I had even given it a shot as a replacement for the dying Dayton 100a amps but hit a practical snag: the coincidental proximity of all those hot tubes to our thermostat did some very interesting things to climate control in our house. Anyhow, out of curiosity I called up a couple of riotously colorful tracks, Pablo Moncayo's Huapango (Benjamin Juarez Echenique leading Orquesta de las Americas) and Rimsky-Korsakoff's Russian Easter Overture (Chicago Symphony Orchestra under Leopold Stokowski, a demonstration class recording, even in my cheap redbook "Classical Music for the Beginner" reissue, that unaccountably seems to have made few ripples in audiophile circles) and tried side-by-side comparisons with the Dayton and the Fisher. The results were probably about what one would expect: the Fisher imparted an overall warmer sound in place of the fluoroscopic detail of the Class-T amp, and in particular the bass was somewhat more pronounced but noticeably less defined. The sharp edges of the solid state amp were replaced with a more rounded presentation that seemed to have a bit more "heft," not that the sound with the Dayton was in any way weak. The Pinnacle BD 650 Series II should be much better known. The $1,500 question, of course, is whether it is worth its almost-never-discounted list price. On the positive side, its fit and finish are admirable, to say the least; the manufacturer, which draws high marks from me for responsiveness to its customers, is an appealing independent operation that has long gone its own quiet way to excell in a single class of product, a survivor in a market that has become ever more hostile; and most importantly, given sympathetic amplification the speaker admirably conveys the detail and power of a wide range of music with bass extension all out of proportion to its size. Moreover, with its front port and compact dimensions it really can be placed on bookshelves if the owner desires, which would make it a particularly good choice for those whose domestic circumstances preclude floor positioning. Sonically, with relatively powerful Class-T amplification it will appeal more to those who like detail than to those who seek a richly "blended" presentation; the latter will be happier driving these speakers with tubed, or at least less strongly detailed, electronics. Unfortunately, the 650 II's high nominal sensitivity rating does not make it a good match for the extremely low-powered Trends 10.1, which simply does not give it enough power to display the speaker's undeniable virtues; presumably the same would be true of other flea-powered amps. From that point of view, I'm afraid the answer to The Result as posited at the outset of this article is "no go"; the search continues for good mates to the original 6-watt T-Amps. That said, having once again with some trepidation placed my faith in the up-powered Dayton alternative, I expect to live happily with my Pinnacles for a long, long time to come. Whether a "value" or not, at this point this listener considers their purchase "money well spent."